Steven Jones is a Technology Director and Global Technical Lead for the AWS Partner Organization. The other day my son, who has headed off to college and is still looking at career options, asked me why I like working at Amazon. I tried as best I could to explain how I get to help Amazon Web Services build service offerings for the some of the world’s most demanding customer workloads performed by computers today, and how lucky I feel to be a part of a company that continues to push boundaries on behalf of customers’ needs and to help drive technology shifts. As an example, last fall we announced the availability of Amazon Elastic Compute Cloud (Amazon EC2) High Memory instances powered by the latest generation Intel® Xeon® Scalable (Skylake) processors, which provide 6, 9, and 12 TB of memory for large in-memory SAP HANA workloads. Since then, customers using these Amazon EC2 High Memory instances for operating their business-critical workloads have told us they love the ease with which they’ve been able to deploy and integrate these native cloud instances seamlessly right alongside their application servers and other AWS services. This unique technology is up for a 2019 SAP Innovation award. And today, High Memory instances deliver the most memory of any SAP-certified cloud instance. We’re not stopping at 12 TB, with larger sizes due out later this year. Based on customer input, we have also been working with SAP to support additional deployment options for Amazon EC2 High Memory instances to support even larger database sizes. 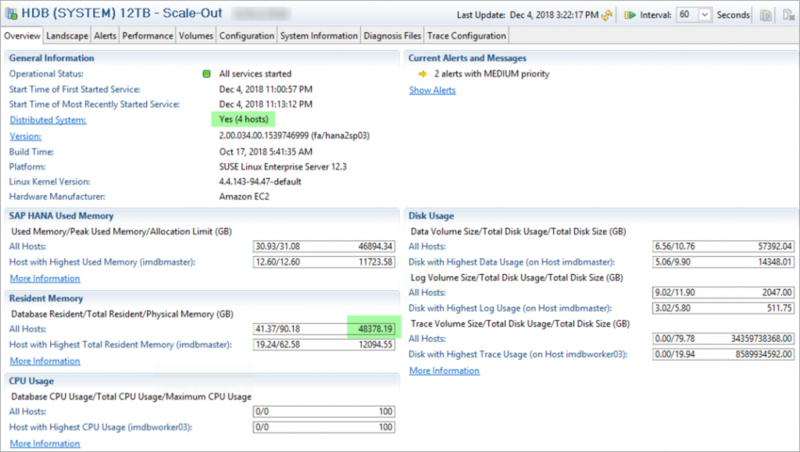 With that, I’m pleased to share with you that SAP has certified scale-out deployments using the 12 TB Amazon EC2 High Memory instance type for S/4HANA workloads. For the first time, you have the ability to leverage scale-out setups for your S/4HANA workloads in the cloud and take advantage of the innovation of the AWS Nitro system, a combination of purpose-built hardware and software components that provide the performance, security, isolation, elasticity, and efficiency of the infrastructure that powers Amazon EC2 instances. You can now scale out up to four nodes, totaling 48 TB of memory, for extremely large S/4HANA deployments. Here’s a screenshot showing a large S/4HANA scale-out cluster with 4 x 12 TB nodes. Over the years, we have worked closely with SAP to build and certify a broad range of Amazon EC2 instance types to provide granular memory deployment options for all types of SAP HANA workloads ranging from 60 GB to 12 TB. Customers tell us they are able to start with the memory sizes they currently need and grow their infrastructure as their individual needs dictate. The best part is that Amazon EC2 instances provide the ability to seamlessly scale up to larger instance types through a simple stop/start process without the need for lengthy migrations or costly outages. When you reach the 12 TB threshold, the scale-out support for S/4HANA means that you can now also scale out incrementally as your needs change. Provisioning large scale-out clusters often requires several weeks or even months of planning and execution with on-premises or colocation setups. On AWS you can provision single node virtual or bare metal systems, and even large SAP HANA scale-out clusters, using our automated AWS Quick Start for SAP HANA in less than an hour. Business continuity is essential with these mission-critical workloads. On-premises or colocation high availability setups almost always leverage a single-data center deployment model. On AWS, you can set up SAP HANA high availability clusters using SAP HANA System Replication across Availability Zones (multiple data centers) within an AWS Region for increased resiliency and protection from data center failures. Additionally, for disaster recovery, you can set up SAP HANA System Replication in asynchronous replication mode across AWS Regions. These instances are available in the US East (N. Virginia), US West (Oregon), Europe (Ireland), Asia Pacific (Tokyo), and AWS GovCloud (US) Regions. If you are ready to get started, contact your AWS account team or use the Contact Us page to make a request. Stay tuned for more information on larger instance sizes, with 18 TB and 24 TB coming later this year.